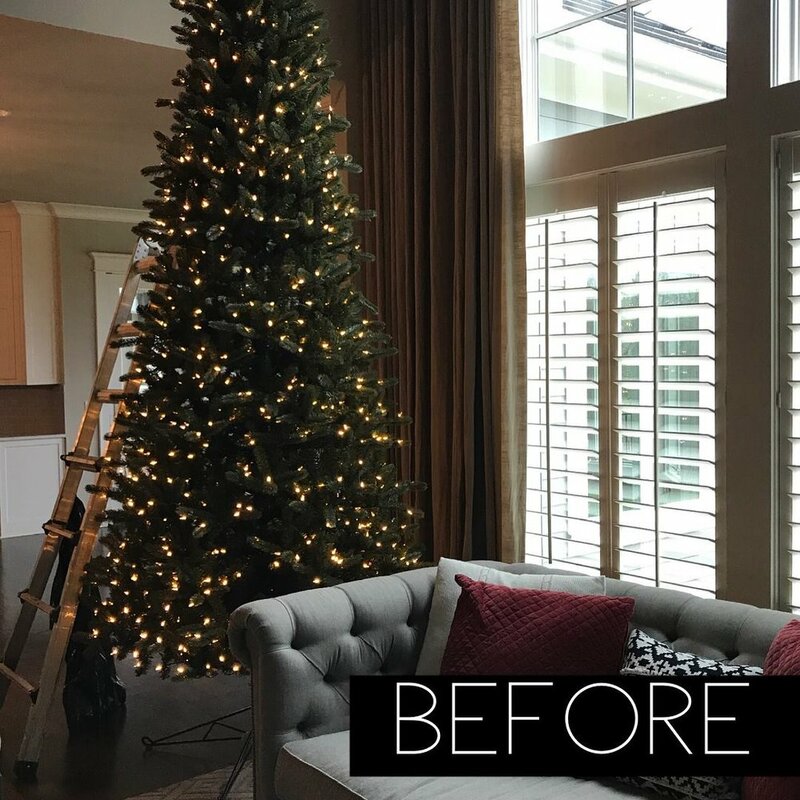 While most people use the change of seasons for the opportunity for a fresh new look, changing out a mantle doesn’t have to be just a seasonal occurrence! Every year after the Christmas decor comes down, I am faced with the challenge of giving our kitchen mantle a facelift. And it’s SO IMPORTANT, because with these cold KC temps we’ve been having, my fireplace is getting a LOT of attention. This year, I wanted to go a completely different direction than I have in years past. I ditched the same ole same ole symmetrical look that I've been giving this mantle year after year! This area in our home sees a lot of faces daily, so it needs to be special! I started by taking down the center mirror and the two wrought iron architectural details that flank the sides of it. Those babies had been up for years and it was time to retire them. I still love the vintage mirror so I decided that it needed to stay and be part of the new look! I found it years ago at a fun vintage store in the West Bottoms in Kansas City. If you live nearby in KC and love vintage find as much as I do, you have to make some time to visit the West Bottoms and all it has to offer! I've also linked similar mirrors below. I truly love cutting boards that look vintage and old. I have had these for quite some time, so I decided that they could spend their time up on the kitchen mantle for a new fresh look! Cutting boards go in the kitchen, right? Mine are from Nell Hills from a while ago, but I've linked similar ones in the "shop my post" section at the bottom of this post! These awesome lantern lights have been on of my favorite lighting options in our home for years so I knew they had to stay because I love them and they provide a sweet glow at night!! So give it a try! Why not try a mantle makeover in your home! In case you haven't noticed, Style And Grace is now part of RewardStyle. 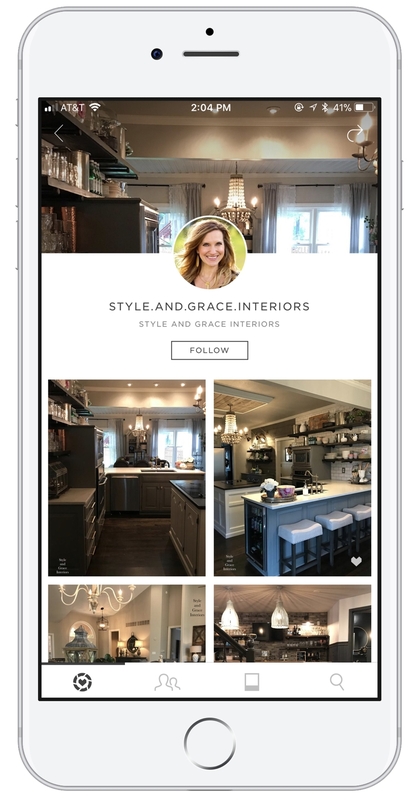 RewardStyle is an online blogging and social media tool that allows bloggers and small businesses to share their products on their blogs and social media accounts in a way that allows followers to click through and/or subscribe and shop the exact products they see in the photos! You know this little circle icon with a heart in it? When you see that icon on a photo, you know it's ready to shop! This is an awesome opportunity for Style and Grace, because when you shop my looks from my links, I get credit! This allows me to experiment with new looks and constantly bring you updates to spaces that you love. 1. Download the App on your smartphone to shop your screenshots. You'll need to create a username and all that, but the LikeToKnow.it app is the easiest way to shop my looks on Instagram! 2. Screenshot my photos on social media! If you see the LikeToKnow.it heart icon in the bottom corner of a photo, you know it's meant for screenshotting! If you're perusing through Instagram/Facebook/Snapchat/etc and you see a photo of mine you like, screenshot it! 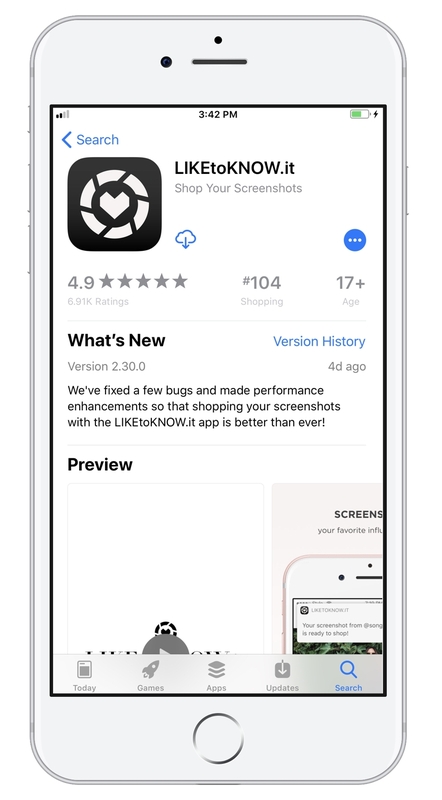 You'll get a notification that your screenshot is ready to shop. You can also "like" the photo and get the same result, but sometimes photos that you "like" take longer to show up in the app than ones you screenshot. Follow my LikeToKnow.It account within the app! This way, you'll never miss a post. Simply click here to go to my page and click follow! Then you can click any of my images and get the info on what's in the photo! Coming Soon - Shop My Looks on the website! One of our goals for 2018 is to really master this whole blogging thing. Pretty soon I'll have a section of my blog dedicated to my favorite products in a way that you can shop them by clicking on the links. I'll be sure to let you know as soon as that's up and running. For now, be sure to sign up for LikeToKnow.it and follow me! Happy New Year, all! Now that the holidays are over, I am so excited to get started with all of the fun things we have in store for 2018. As I sat down to think of my goals for this year, I thought it would be fun to share them with all of you. My community of followers is so supportive and loving, what better way to hold myself accountable than sharing my goals with you! Okay, I know this is one that everyone has, but I'm serious! Right now I do Pilates reformer on Mondays Wednesdays and Fridays, but I'm looking forward to adding my boxing regimen back in on Tuesdays and Thursdays! It's so easy to fall off of your regular routine during the holidays, but no more excuses. I'm excited to get back in there and start hitting those bags! If you've been following along on my Instagram, the handy hubs and I redid the kitchen in 2017. I'm going to start using it to its full potential! Last week I went to Costco and bought everything I needed to do individual smoothie bags so they are ready and in my freezer. I'd also like to get better about meal planning, so that we eat out less! January is the time of the year where I like to really get into closets and cabinets and purge out everything we haven't used in the last year! It's a great time to get everything cleaned out and donate things that we no longer need. We are excited to get a plan together for our next phase of renovations in our home! There are lots of surprises you'll have to stay tuned for. This spring, we are creating another sitting area outside behind the garage. Our kids are finally at the age where they no longer need the trampoline or play in the backyard, so we donated it and we are ready to make that space usable again! Stay tuned! I'm going to spend 2018 mastering "being a blogger." I'm sure you've noticed over on Instagram that Style And Grace is now part of RewardStyle and LikeToKnow.it. For those who don't know what that is, RewardStyle is a program for fashion and home influencers to share their looks with their followers in a way so that their followers can easily shop the products online. I'm constantly answering the question "omg this is so cute, where did you get it?" With RewardStyle, it makes it easy for me to show you! It's a way for me to share my favorites so that it provides a link directly to the spot where you can buy them for your own home. This is a giant undertaking, so I've even got myself a gal to help me wrangle it all. Katie is a Social Media QUEEN, and she'll be helping me manage my blog and optimize all things social! So, if there's anything you'd like to see on the blog, PLEASE let me know! Olivia is graduating in May, so I'm going to start planning for her graduation party! Everyone says that your kids will grow up so fast and before you know it, they will be off to college. I never realized how true that was, until this year. We'll be throwing her a big bash this May, and my wheels are already cranking on how to get this place decorated with all things Olivia. Ugh, my life is so hard. Gotta plan an awesome family vacay. We're headed to the land of Aloha and Mai Tais this summer. If anyone has any recommendations on must-sees, please let me know! To close out on 2017, I've included some of my favorite finds from the year below. Like I mentioned above, you can click on these items to shop them for yourself! How cool is that!? Click any of these links to shop for yourself! I am more than grateful for all the love and support I get from my little online community. I hold it close to my heart and thank my lucky stars every day that I get to have the job of my dreams! Thank you to all of you who are on this journey with me. Please stay close because it means more than you know! Here's to a wonderful 2018 for all of us! Welcome to the Table Topper! Join me as I walk you through the VERY EASY steps that you will need to take to bring your table from flat to FABULOUS! Believe me, it's easy but your guests will think that you spent hours on it! Join us for dinner on a layered tablescape! 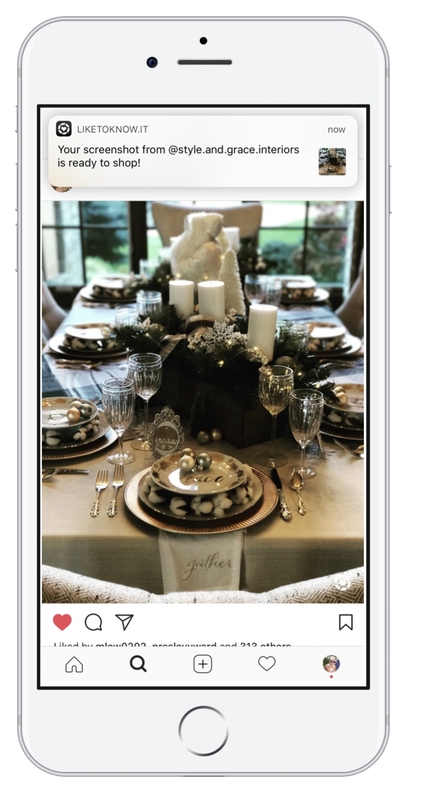 This year for the holidays I had the pleasure of styling a client's home for the holidays. I decorated from stem to stern, even the dining room table! My clients wanted their guests to feel warm and welcomed the minute they walked in the door. There is something special about sitting around a table with friends and family. An inviting table can make guests want to linger longer, and isn't that what the holidays are all about? So how did I get the look? Well, come take a peek! My secret formula is LAYERS. Lots and lots of layers. Start with a good base. Any tablecloth will do as long as it is neutral. In the end, we will be layering so many beautiful things on top of it! The tablecloth in this picture? It's a THROW! Yes, a throw. Why not? It's plaid and it has the perfect color tones! While I was shopping at World Market, I can across this cute plaid throw and I knew that it had to be the next LAYER of this tablescape! It gives a feeling of being wrapped in a cozy blanket! Chargers are those are good for so many things, but this time I used them the traditional way! I found these gold chargers at Micheal's for a steal! How can you beat $3? I was also lucky enough to find two of these evergreen centerpieces at HomeGoods! I just jazzed them up a bit by adding some loose ornaments and battery-operated lights (a must in every home for the holidays)! The next thing I came across were these sweet little cotton ball wreaths! There are so many ways to use these and one of my favorite ways is to layer them under plates! It gives the place setting height and dimension! Make your place setting different. Give them something to talk about! I also always love to incorporate things that MEAN something. You can always make the things you already own work with your new designs! You just have to build off of them and make it look like they were always intended to be placed together! My clients wanted to use their Grandmother's china for this tablescape, so I just built off that color palette! Her beautiful crystal also really gives this table some SHINE! These cute plates were a must! They have four different sayings! I love adding a little whimsy to a table! Take a seat and be our guest! Everyone will feel special when they find their name in a sweet little frame like this. Name cards are great, but why not go the extra step and make them special? I found these little crystal frames at Michael's for around $6 each! Then I just picked up some gift tags, wrote the guest's names on each one and "framed" them! You are almost done! Now all you need is a fun little cloth napkin to finish off the look! I came across these "gather" napkins at HomeGoods and knew they were going to be the perfect final touch! You are DONE! You are ready to host a fun dinner party and seat your guests at a table that you can be proud of! Setting tables for people should be way for you to express how you feel! Making a pretty tablescape doesn't have to cost a lot of money. You can load it up with things that you may never have thought you could use on a table before! How will you be spending your holiday dinners? I would love to hear from you! The Final Stop of the Style & Grace Christmas Race! Annnndddd that's a WRAP! The Style and Grace Christmas Race is finished! This install was like coming home! A warm welcome when I came in the door, greeted by just two of the 5 awesome family members who live here: One 5 year-old little man (who basically stole my heart the first time I met him) and his sweet loving mama who always makes me smile! This was where it all started! This was the home that made me realize that I LOVE design and that I really could have a career that I love and still be there for my family all the time! This was the home and the family that took a giant leap of faith and put all their trust in a girl just getting started and told her to "go for it!" They put their home on tour and raised a lot of money for Childhood Cancer, while giving me the courage I needed to follow a dream. That is priceless. Faith and trust are priceless. The end of this long but important post is that at the end of the day (or in this case, 7 holiday decorating days), I realize what I've probably known all along. All these homes that I styled for the holidays are different. Just like my clients, they are all different and have different visions for their spaces, yet they all still call on me to design their homes. They let me be creative. They allow me to have fun doing what I love the most. They give me opportunities that I don't take for granted. I know that I am lucky that they choose me and that I get to be part of giving them the home of their dreams and the cherry on top is going "home" to decorate it for the holidays!